"Bloem" redirects here. For the surname and given name, see Bloem (name). Bloemfontein (/ˈbluːmfɒnteɪn/; Afrikaans: [ˈblumfɔntəi̯n]; Afrikaans and Dutch "fountain of flowers" or "blooming fountain"; also known as Bloem) is the capital city of the province of Free State of South Africa; and, as the judicial capital of the nation, one of South Africa's three national capitals (the other two being Cape Town, the legislative capital, and Pretoria, the administrative capital) and is the seventh largest city in South Africa. Situated at an altitude of 1,395 m (4,577 ft) above sea level, the city is home to approximately 520,000 residents and forms part of the Mangaung Metropolitan Municipality which has a population of 747,431. Bloemfontein also host sub-Saharan Africa's first digital planetarium, the Naval Hill Planetarium and Boyden Observatory, an astronomical research observatory erected by Harvard University. Bloemfontein is popularly and poetically known as "the city of roses", for its abundance of these flowers and the annual rose festival held there. The city's Sesotho name is Mangaung, meaning "place of cheetahs". The origin of the city's name is disputed. It is likely borrowed from the Dutch words bloem (flower) and fontein (fountain), meaning fountain of flowers. Popular legends include an ox named "Bloem" owned by Rudolphus Martinus Brits, one of the pioneer farmers that was taken by a lion near a fountain on his property, while another story names Jan Bloem (1775–1858), a Korana KhoiKhoi leader who settled there. Warden originally chose the site largely because of its proximity to the main route to Winburg, the spacious open country, and the absence of horse sickness. Bloemfontein was the original farm of Johannes Nicolaas Brits born 21 February 1790, owner and first inhabitant of Bloemfontein. Johann – as he was known – sold the farm to Major Warden. 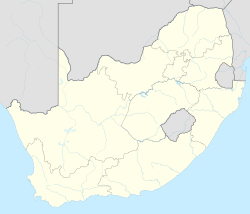 The Orange Free State was an independent Boer sovereign republic in southern Africa during the second half of the 19th century. Extending between the Orange and Vaal rivers, its borders were determined by the United Kingdom of Great Britain and Ireland in 1848 when the region was proclaimed as the Orange River Sovereignty, with a seat of a British Resident in Bloemfontein. As the capital of the Orange Free State Republic the growth and maturing of the Republic resulted in the growth of Bloemfontein. Numerous public buildings that remain in use today were constructed. This was largely facilitated by the excellent governance of the Republic (which acquired the term model republic) and the compensation from the British for the loss of the diamond rich Griqualand area. The old Orange Free State's presidential residence the Old Presidency is currently a museum and cultural space in the city. A railway line was built in 1890 connecting Bloemfontein to Cape Town. The writer J. R. R. Tolkien was born in the city on 3 January 1892, though his family left South Africa following the death of his father, Arthur Tolkien, while Tolkien was only three. He recorded that his earliest memories were of "a hot country". In 1899 the city was the site of the Bloemfontein Conference, which failed to prevent the outbreak of the Second Boer War. The conference was a final attempt to avert a war between Britain and the South African Republic. With its failure the stage was set for war, which broke out on 11 October 1899. The rail line from Cape Town provided a centrally located railway station, and proved critical to the British in occupying the city later. On 13 March 1900, following the Battle of Paardeberg, British forces captured the city and built a concentration camp nearby to house Boer women and children. The National Women's Monument, on the outskirts of the city, pays homage to the 26,370 women and children as well as 1,421 old men (also 14,154 black people, though some sources feel that the records are unsatisfactory, and that this number could be as high as 20,000) who died in these camps in various parts of the country. The hill in town was named Naval Hill after the naval guns brought in by the British in order to fortify the position against attack. On 31 May 1910, exactly eight years after the Boers signed the Peace Treaty of Vereeniging that ended the Anglo-Boer War between the British Empire and two Boer states, the South African Republic (Republic of Transvaal) and the Orange Free State, South Africa became a Union. 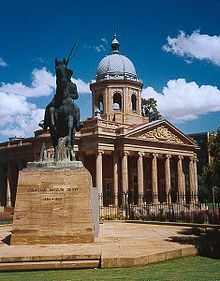 Due to disagreements over where the Union's capital should be, a compromise was reached that allowed Bloemfontein to host Appellate Division and become the Union's judicial capital. Bloemfontein was also given financial compensation. On 8 January 1912, the South African Native National Congress (SANNC) was founded in Bloemfontein. The Union of South Africa had not granted rights to black South Africans, causing the organisation's creation. Its primary aim was to fight for the rights of black South Africans. From 1 to 9 January 1914, James Barry Munnik Hertzog and his supporters met in Bloemfontein to form the National Party of the Orange Free State, and to lay down its principles, following Hertzog's exit from the South African Party in 1913. The National Party grew to govern South Africa in 1948 and implement the policy of racial segregation known as apartheid. When the National Party won the 1948 South African national government elections they began implementing the policy known as apartheid. The policy was built on white supremacy and racial segregation was implemented. In Bloemfontein, residential segregation had begun in the 19th century with the passing of Ordinance 1 of 1860, which determined that no non-white, without written permission from the landlord, had the right to occupy urban land in towns where local municipalities did not yet exist. On 3 June 1861, the council demarcated three locations in the following areas; the black population was to move to the area which lay to the right of a neighbourhood that was known as Kaffirfontein, Coloureds were to move to the Waaihoek Black residential area on the eastern outskirts of the town. The inhabitants of these settlements had to pay taxes; the so-called hut tax as well as tax on grazing rights. This laid the foundation for the implementation of residential urban segregation as envisaged by the architects of apartheid. When the South African apartheid government passed the Group Areas Act of 1950, the Bloemfontein municipality put into effect changes in the racial set-up of the city. The municipality demolished the Cape Stands residential area which was occupied by the city's coloured population and moved the residents to Heidedal. However, due to Coloureds living in such close proximity with black people; intermarriages across racial lines occurred, resulting in a partial mixed population in Heidedal and Mangaung. In 1952 the Bloemfontein municipality began building new residential areas for the city's black population. New residential areas to separate ethnic groups such as Sotho, Xhosa and Tswana were formed. The residential areas were jointly known as Mangaung. Phahameng, a Sotho township, was the first formal housing projects to be approved by the municipality in 1956. Physical buffers such as the railway line and roads were put into place to separate black ethnic groups, the white and coloured population.11 000 housing structures, of which approximately 6 000 were government built rental accommodation, were erected in Mangaung between 1952- 1968. In 1968, Mangaung faced serious housing shortages when as much as 3000 to 6000 housing units were needed. To counter this problem, a 55 km east ward expansion called Botshabelo was added in 1979. The Bloemfontein municipality channelled of all black urbanisation to Thaba Nchu and Botshabelo. Botshabelo was developed as source of cheap labour for the city of Bloemfontein. A subsidised bus service was established, and Botshabelo was declared decentralisation point. This means that Botshabelo was to become an industrial development point in order to reduce the distance between place of employment and place of residence. In 1988, an approximate 14 500 people were commuting on a daily basis between Botshabelo and Bloemfontein. This meant that 55% of Botshabelo's work force was employed outside the city. In 1994, after the disestablishment of the apartheid government, Bloemfontein, Botshabelo, and Thaba Nchu became part of Motheo District Municipality. The Motheo District Municipality was disestablished on 18 May 2011 and Mangaung was upgraded to become an autonomous metropolitan municipality with Bloemfontein as the main seat. Until 1994 the city was the sole judicial capital of South Africa. It remains the seat for the Supreme Court Of Appeal (formerly the Appellate Division of the Supreme Court). It is also an administrative center with many private hospitals and educational institutions. Free State Provincial Government building Bloemfontein forms part of the Mangaung Metropolitan Municipality, which was upgraded from a Local Municipality in 2011. The Mangaung Metropolitan Municipality elects a municipal council for five-year periods, through a mixed-member proportional representation (MMP) system in which wards elect individual councillors alongside those named from party lists. Voters get two votes: one for a representative to become a ward councillor and the other for a political party. The latter vote is used to distribute seats in the municipal council amongst parties while the former distributes seats through the individual representatives. The current Executive Mayor of Mangaung, Olly Mlamleli, was elected in August 2016. Bloemfontein is located in central South Africa on the southern edge of the Highveld at an elevation of 1,400 metres (4,600 ft), bordering on the semi-arid region of the Karoo. The area is generally flat with occasional hills (koppies in Afrikaans) and the general vegetation is Highveld grassland. Bloemfontein experiences a semi-arid climate (Köppen: BSk ), with hot summer days and cooler, dry winters, often with frosts. Snow is rare but as recently as August 2006 it snowed in the city, with snowfalls occurring again at the airport on 26 July 2007. Bloemfontein suburbs include Heidedal to the east and southeast, Bain's Vlei, Woodland Hills Wildlife Estate, Brandwag, Ehrlich Park, Fauna, Fichardt Park, Fleurdal, Gardenia Park, Generaal De Wet, Hospitaalpark, Kiepersol, Lourier Park, Park West, Pellissier, Uitsig, Universitas, Westdene, Wilgehof and Willows to the south of the city. To the west of Bloemfontein, you will find Langenhoven Park. To the north you will find Arboretum, Baysvalley, Bayswater, Dan Pienaar, Helicon Heights, Heuwelsig, Hillsboro, Hillside, Hilton, Naval Hill, Navalsig, Noordhoek, Pentagon Park, Panorama Park, and Waverley. To the north east you will find Roodewal and Vallombrosa. The predominantly black suburbs are; Rocklands, Phahameng, Phelindaba, Bloemanda, Bochabela and the most historic Batho where the Maphikela House (where the African National Congress started) is situated. The Free State Stadium and the surrounding sports complex is the main sports venue in the city and province. The venue was the hosting stadium of the 2010 FIFA World Cup South Africa matches played in Bloemfontein. There are several other sports venues in the city, however, including facilities belonging to the university, schools and sports clubs.other stadium's in the city is Mangaung Oval, Dr. Petrus Molemela Stadium and Clive Solomons Stadium. Bloemfontein's Free State Stadium is home to two rugby union teams; the Cheetahs who compete in the Pro 14 and the Free State Cheetahs who play in the domestic Currie Cup. The Free State Cheetahs won the Currie Cup in 2005 against the Blue Bulls, they drew the final with the Blue Bulls in 2006 and retained the Currie Cup title in 2007 by beating the Golden Lions resulting in the Cheetahs remaining Currie Cup champions until 2008 when the failed to make the final for the first time since 2004. 2009 saw the Cheetahs return to the Currie Cup final but they were unable to beat the Blue Bulls at Loftus Versfeld. In 2016 the Cheetahs won the Currie Cup after a perfect season, beating the Blue Bulls at home in Bloemfontein. The Knights cricket team representing the Free State and Northern Cape in various series is located at Mangaung Oval, part of the Free State Stadium complex. Bloemfontein features as a regular venue for touring international and local cricket teams. The town has one of the most active soaring communities in South Africa and the world, using the New Tempe Airport, north of Bloemfontein. Bloemfontein has a motocross track (tempe) run by the Bloemfontein Off Road Club, as well as a go-kart circuit (M&F Raceway), which was closed down in early 2015. Bloemfontein has a comprehensive shooting centre 20 km (12 mi) south of the city, offering most forms of shooting including various clay target, pistol and rifle disciplines. Bloemfontein's shooting sport community has produced many provincial and national representatives over the years. Bloemfontein has two rock climbing clubs, each with a wall and boulder cave. Every year Bloemfontein, the 'City of Roses', celebrates the 'Bloemfontein Rose Festival', known also as the 'Mangaung Rose Festival', in October—the cool month in which roses in the Free State bloom best. The majority of the events happen at the Loch Logan Waterfront in Bloemfontein. The festival attracts rose enthusiasts from all over South Africa and the world to participate in and experience this grand showcase of roses and other local events and attractions. The festival has made Bloemfontein a popular tourist destination as thousands of people attend the festival annually. The first rose festival first took place in 1976, when council members decided that hosting such a festival was appropriate, given the area's name. In 1976 the events spanned over a few days and included activities related to roses in the Sanlam Plaza. Since then, the rose festival has expanded and grown to meet the needs and interests of the public. Horticulturalists are invited to take part in competitions that focus on designing and improving unkempt gardens around the city. Festival activities take place in private gardens all over Bloemfontein, as local residents of the city open their gardens to the general public. Most festival activities take place at the Loch Logan Waterfront, the largest shopping centre in central South Africa. It spans about 80 000 m² of space and is the hub of shopping, entertainment, sport and culture in Bloemfontein. The waterfront displays flowers created by local nursaries as well as the official municipal display created by the parks department, which is organised by the Mangaung Municipality. The Free State Rose Society's champion Rose Cut Competition, with approximately 700 entrants every year, is also hosted at the Waterfront, along with the Miss Volksblad Rosebud competition for girls aged 3–4 years old, organised in conjunction with the Volksblad daily newspaper. The Rose Morning High Tea usually occurs at the Urth Garden Centre where tea and treats are served. The Urth Garden Centre is a retail and wholesale nursery that is located on Kenneth Kaunda Road in Bloemfontein. The crowning of the King and of Mangaung in the year of nomination. The Mangaung Rose Classic Cycle Tour is a road race that happens during the festival every year. The event is organised by AfriCycle Tours and the dates are announced annually.The race starts at the Urth and the race distances include 22 km, 56 km and 106 km. This expo forms part of the Mangaung/Bloemfontein Rose Festival and gives 'green' and organic local businesses an opportunity to promote their businesses. This includes showcasing different products and services that support a green environment, such as solar power, grey water systems, vegetable tunnels, JoJo tank systems, etc. Bloemfontein houses many institutions of learning, from pre-schools to universities and colleges. Classes are taught in different languages from school to school, with some schools even teaching all their classes in two languages. The languages are predominantly Afrikaans, English, and Sesotho. Bloemfontein's economy is driven by the government sector. Some of South Africa's largest retail companies have headquarters located in the city. Queen of Roses also happens during this event. The competition recognizes citizens of the City of Bloemfontein for contributions that go beyond their normal duties to enrich the Mangaung Metro. Nominees need to be citizens. The largest tertiary institutions in Bloemfontein are the University of the Free State and the Central University of Technology. There is a Further Education and Training College called Motheo FET College which comprises three main campuses(Thaba N'chu, Hillside view and Bloemfontein) and the satellite campuses in Zastron, Philippolis and Botshabelo. Boston City Campus focuses on video based, self study. There are a variety of academic divisions. CTU Training Solutions focuses on IT and multi-media. Damelin focuses on budget education offered for full-time, part-time and via correspondence. There are a variety of academic divisions. Qualitas Career Academy, caters for full-time and part-time studies for students as well as corporate training and consulting services for businesses and government departments. There are a variety of academic divisions. ATTI (Advanced Technology Training Institute) offers short short courses and skills programs with a strong focus on IT subjects and also provides training for corporate clients in various IT programs. Bloemfontein's national and regional roads are as follows: The N1, a major highway running roughly SE to NW from Cape Town to Johannesburg and Zimbabwe largely bypasses this city to the west. The N8 runs east/west connecting Bloemfontein to Kimberley and Maseru, the capital of Lesotho. Bloemfontein is also the northern end of the N6 road heading roughly southwards to the port of East London. At a T-junction just before the city, the N6 becomes the M30, and the intersecting road is designated the N6. This road ends in an interchange with the N1. There are also two two-digit R routes: the R64, which is the old road to Kimberley, via Dealesville and Boshof. It ends at the N1. The R30 ends at the N1 north of the town. It is the road to Welkom. Below that level, Bloemfontein has a number of metropolitan or M roads. These roads are numbered independently of m roads in other South African cities. Bloemfontein is well connected with rail.It is located on the most important rail junction between Johannesburg and Cape Town, with daily trains to Port Elizabeth, East London and Johannesburg. Bloemfontein has two airports New Tempe Aerodrome and Bram Fischer International Airport. New Tempe Aerodrome has no scheduled flights, it is used as a training facility for aviators and schools. Bram Fischer International Airport has scheduled flights to all South Africa's major cities. In October 2016, the Mangaung Metropolitan and various taxi associations reached an agreement on the Integrated Public Transport system which is currently under construction. The project consist of two phases, the first phase will see the construction of bus ways along the Metropolitan. The second will be the building of depot and stations. Tony Kgoroge, South African actor, performances in movies including Hotel Rwanda, Blood Diamond, Invictus, Lord of War and Skin. J. R. R. Tolkien CBE was born in Bloemfontein on 3 January 1892. Tolkien is famous for his fantasy epics The Hobbit, The Lord of the Rings and The Silmarillion. When aged 3, Tolkien left South Africa for England. Gerrit Badenhorst, a powerlifter and strongman competitor. Seventh-day Adventist Church, Southern African headquarters. Christian Revival Church, is the largest church in Bloemfontein with over 30,000 members. CRC's net is widely cast and is established in Bloemfontein, Pretoria and Johannesburg along with 90 national and international CRC Churches worldwide, executing the mission of "One Church, Many Locations" throughout South Africa, Europe, America & Australia. The church is led by Pastor At Boshoff, together with his wife Nyretta. New Covenant Ministries International had a church called Fountainhead led by Chris Gerber. It was a New Testament Church known by the name Fountainhead Church International. Later this church merged with Doxa Deo Bloemfontein, which is now the name of the combined church. The city also has a large Jewish population, which was established during the mid-19th century. The Old Cemetery: Over 1,000 names from the three cemeteries. Old: The oldest of the three cemeteries, dating from 1871, is simply a small fenced off area of a public cemetery near the city center. It includes a few graves of several Jewish pioneers involved in the early days of the city who died serving on either side in the Boer War, 1899–1902. Each of the thirty or so tombstones of these pioneer families has been completely transcribed. South Park: This cemetery was consecrated in 1978 and now includes more than 10 000 graves and is the biggest cemetery in the Free State. On 7 October 2010, Several tombstones in the Jewish cemetery in Bloemfontein were defaced with swastikas and antisemitic graffiti. On 10 April 2012, Bloemfontein's historic Memorium cemetery was vandalized, with 35 tombstones toppled and obscene graffiti daubed on the walls of the adjoining Ohel. The graffiti included images of money bags and diamonds, as well as of a crudely drawn Magen David, allegedly as part of an anti-Semitic act. There is also the old Phahameng cemetery which dates back to the 1960s and was specifically reserved for Africans during the apartheid era and has a Heroes Acre, where freedom fighters are laid to rest. The Heide Heights cemetery in Heidedal was reserved for coloured people during the apartheid era but all races could bury their dead after 1994. This cemetery has been closed due to it being full. Round Table 158 Bloemfontein The first Round Table was formed in Norwich, England in 1927. The founder, Louis Marchesi, was a young member of Norwich Rotary Club who felt a need existed for a club where the young business men of the town could gather on a regular basis. At their meetings they could exchange ideas, learn from the experiences of their colleagues and play a collective part in the civic life of Norwich. From a very early stage it was agreed that Round Table would be a non-religious, non-political club and this has continued to this day. Child Welfare Bloemfontein Child Welfare Bloemfontein & Childline Free State is a non-profit organisation that was founded in 1914 by a group of volunteers who identified a need for welfare services among the community. In 2004, Child Welfare Bloemfontein celebrated its 90th birthday. Over the past 90 years, many community programmes have been successfully implemented. FreeMasons The Masonic Centre, Bloemfontein, was built during the 1970s when all the Masonic Lodges in Bloemfontein, sold their individual properties. The Centre was erected to facilitate all Masonic activities in Bloemfontein and surrounding areas. All four Constitutions that is active in South Africa, gather at the Centre. The Lodges that has ownership of the Centre is Lodge Unie (est. 1864); the Rising Star Lodge (est. 1865); Thistle Lodge (est.1903); Emerald Lodge (est. 1905); Lodge Dagbreek (est. 1932) & Lodge Oranje (est. 1964). Various side degrees are catered for at the Centre which includes the Mark, Ark, the Royal Arch & Rose Croix. Bloemfontein has a rich Masonic history especially in the Anglo Boer War (1899–1902), with members such as Lord Kitchener, Rudyard Kipling and Sir Arthur Conan Doyle, visiting Lodges in Bloemfontein. ^ a b c d e "Main Place Bloemfontein". Census 2011. ^ a b Cox, Wendell (2017). Demographia World Urban Areas 13th Edition (PDF). Demograhia. pp. 20–36. ^ "Statistics By Place: Mangaung". www.statssa.gov.za. Statistics South Africa. Retrieved 15 December 2017. ^ "Bloemfontein | national judicial capital, South Africa". Encyclopedia Britannica. Retrieved 19 December 2018. ^ Bridget Hilton-Barber (2001). Weekends with Legends. New Africa Books. p. 98. ISBN 978-0-86486-471-0. ^ "History of Bloemfontein, Free State, South Africa". Bloemfontein Guide. Retrieved 20 January 2017. ^ "Concentration Camps during Anglo-Boer War". www.anglo-boer.co.za. ^ Biggins, David. "Anglo Boer War - Blockhouses". www.angloboerwar.com. ^ tinashe (8 November 2011). "The Union of South Africa 1910". South African History Online. Retrieved 16 December 2017. ^ The South Africa Act, 1909. The American Journal of International Law. 1 January 1910 – via Internet Archive. ^ sahoboss (20 March 2011). "African National Congress (ANC)". South African History Online. Retrieved 16 December 2017. ^ sahoboss (30 March 2011). "National Party (NP)". South African History Online. Retrieved 16 December 2017. ^ a b "Bloemfontein the Segregated city". SA History Online. 30 March 2011. ^ "Review Of Apartheid In Bloemfontein Verno Cultural Studies Essay". Uni Assignment. ^ "Apartheid and housing in Mangaung and Botshabelo". Impuls centrum. ^ a b "Climate data for Bloemfontein". South African Weather Service. Archived from the original on 15 March 2012. Retrieved 7 March 2010. ^ "Bloemfontein Climate Normals 1961−1990". National Oceanic and Atmospheric Administration. Retrieved 29 November 2013. ^ "Toyota Cheetahs". Guinness PRO14. 29 August 2017. Retrieved 14 September 2017. ^ "IMSSU - World Championship Results". www.imssu.org. Retrieved 14 March 2019. ^ "IMSSU World Championships 2016". www.imssu.org. Retrieved 14 March 2019. ^ "Exciting start to Bloemfontein wall". www.sancf.org. ^ a b "Bloemfontein Rose Festival". ShowMe™ - South Africa. ^ "Mangaung Rose Festival - Events in Bloemfontein". www.bloemfontein-information.co.za. ^ a b "Bloemfontein Rose Festival/Fees". www.internext.co.za. ^ a b "Bloemfontein Rose Festival". www.sa-venues.com. ^ a b c "Bloemfontein Rose Festival 2016". Sleeping-OUT. ^ Ane. "Loch Logan Waterfront Centre - Bloemfontein Directory". www.bloemdirectory.co.za. ^ Maricelle (7 September 2016). "Are you the very first King or Queen of Roses? - Bloemfontein Courant". ^ "Home". Archived from the original on 6 November 2017. Retrieved 22 June 2017. ^ "Lets Green BLOEM Expo". www.wherevent.com. ^ Monster Family Fun Competition 1 March 2018 (1 March 2018). "Go Green Expo – Bloemskou | 26 April – 05 May 2018". Bloemskou.co.za. Retrieved 7 June 2018. ^ "HighTea - Mangaung Rose Festival". ^ "University of Glasgow :: Story :: Biography of John Vernon Harrison". www.universitystory.gla.ac.uk. ^ alphawebdesign.co.za. "Christian Revival Church - Win the lost at any cost!". www.crc.org.za. ^ Issroff, Dr Saul. "A HISTORY OF THE JEWISH COMMUNITY ARCHIVES". Saul Issroff, Mike Getz, SAfrica SIG and Jewishgen Inc. Retrieved 19 August 2012. ^ "BLOEMFONTEIN - Free State Prov". International Jewish Cemetery Project. Retrieved 19 August 2012. ^ "South Africa – Jewish cemetery was desecrated". CFCA. Retrieved 19 August 2012. ^ "Jewish cemetery vandalized". CFCA. Retrieved 19 August 2012. Wikivoyage has a travel guide for Bloemfontein.